This is not so much a recipe as it is an ode to my garden. I love my garden. After admiring the garden of a good friend last spring, I was surprised by him pulling up to my house one Saturday morning with some lumber, tools, and a pickup truck full of soil. A few short hours later I had my own raised garden bed. Last go around, my garden yielded zucchinis, red peppers, snap peas, green bush beans, and cucumbers. For this winter garden I planted cilantro, yellow pear tomatoes, yellow peppers, zucchini, okra, butternut squash, and scallopini bush squash. While it’s been quite the bounty, I think I’ve been most pleased with the butternut squash production because at the store they run over $3/lb … and we all know how heavy those things are! (Are butternut squash that expensive everywhere or just on Maui?) 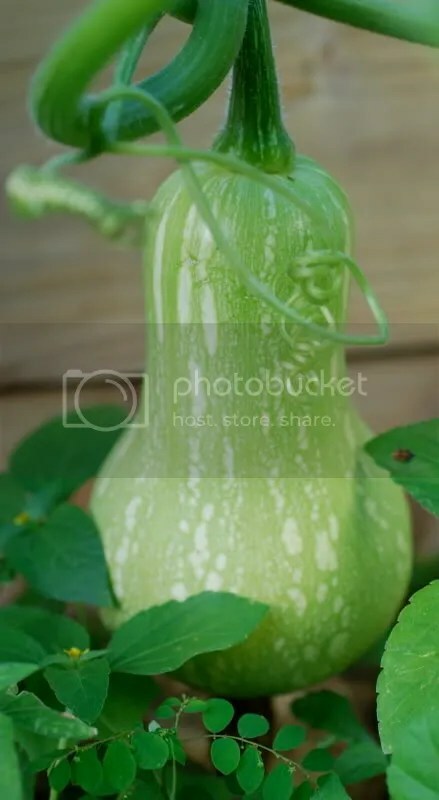 I just made a batch of butternut squash bisque two nights ago with two squashes from the garden and the fresh taste converted butternut -hating Dan into a true believer. Sadly, we dove into the bisque so quickly that there was no photographic evidence to prove its existence … so, instead, I will share with you the first fruits of my unbelievably large tomato plant. My tomato plant is heavy with tomatoes, but they are taking their sweet time ripening. Tonight yielded the first yellow tomatoes form the plant … five beautiful, yellow tomatoes. Small tomatoes. What does one do with five small tomatoes? In my case, I made tomato carpaccio. 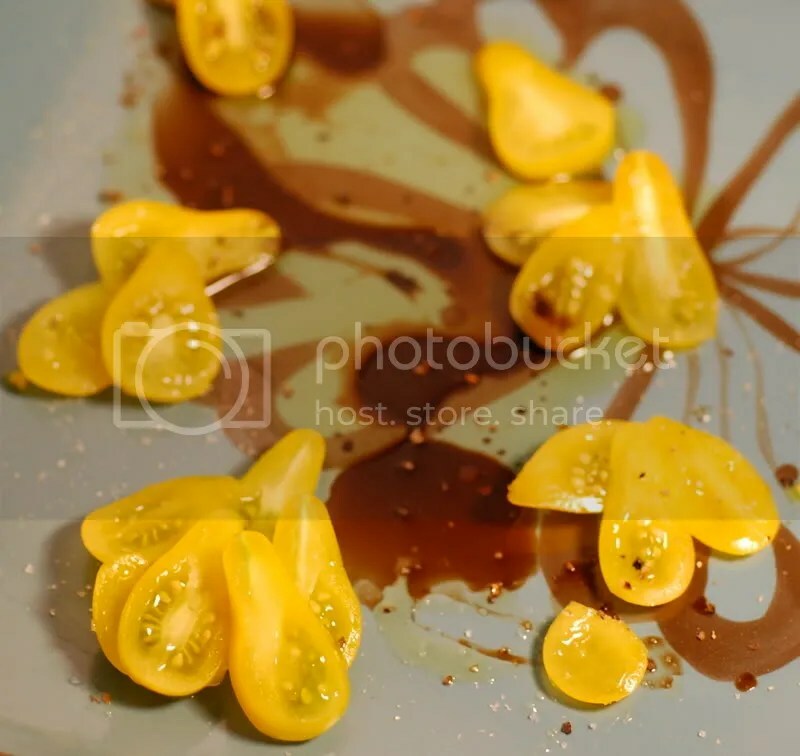 I sliced each of my little ‘maters into three or four thin slices, placed them on a plate drizzled with balsamic vinegar and olive oil, and I lightly seasoned them with salt and pepper. Basil would have been a lovely finishing touch, but alas, I had none on hand. Enjoy – we sure did! Those tomatoes are gorgeous. There’s nothing more satisfying than eating fresh tomatoes that you’ve grown yourself and nurtured to ripen properly. I am so jealous. Straight up. Butternut Squash is like 60 cents a pound in SF. Good work Gail. Gail, that’s just not even right to post such gorgeous pictures. You are so lucky to grow your own food! I am SO jealous! I think that the “high” here in MN was 6 today…yes, that is right–six. I want fresh home grown tomatoes!!! They look amazing! I’ll preface this by saying that I seem to be growing more sentimental with age, but I was so touched to read about your friend’s building you a garden after you admired his. That’s what y’all mean by “aloha,” right? Romina – I couldn’t agree more. I love the dishes made from my garden the best. 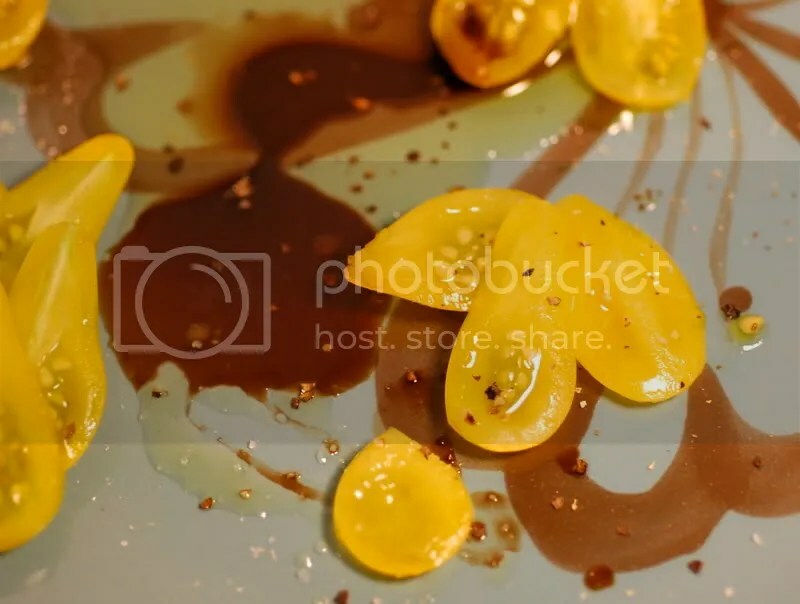 James – The land of Wine, honey … and butternut squashes. Consider me jealous. Azure – Thank you for the compliment – I’m glad you liked the pics! Courtney – Just reading that number “6” made me cold! I have to go find a hat to pull on now …. Emily – Absolutely, that is the epitome of aloha. That is Mark’s, my gardening buddy, style. It makes me appreciate my garden even more. 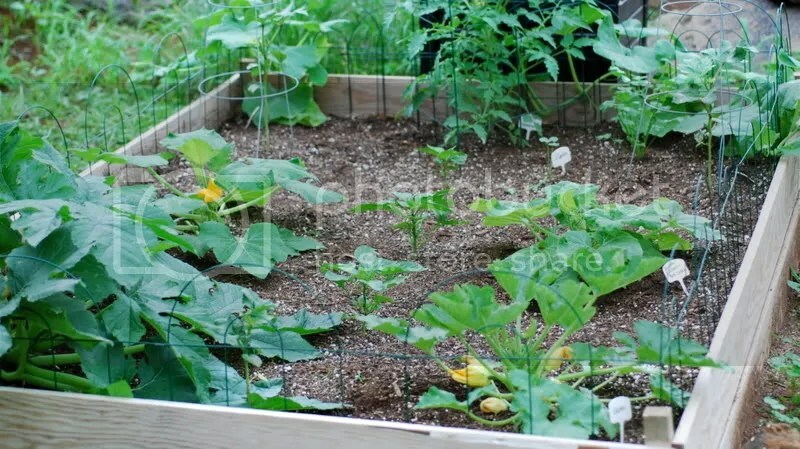 Hi Gail, I would (a) love to have such a great vege garden; and (b) have the ability to grow veges rather than kill things (I should wear a sign to warn off all plants). This would be gerat – so satisfying to grow and eat your own produce. The garden looks magnificent gail!! Congrats on another year of crop!!! Cakelaw – I am terrible with indoor plants – I kill ’em all! But I can keep the outdoor plants going (with some help from Mother Nature). If you ever have the chance to plant a garden, you should go for it! Stina – Come visit again and eat fresh ‘maters! We love your blog… We have an indoor garden of our own that looks amazing.